Google and the ADA – CINECLAST • FILM, FOOD, & FOREIGN PLACES. I had the profound opportunity to travel around the U.S. last month interviewing some of the pioneers and champions of those with disabilities. Google and the ADA really opened my eyes to the changes that we’ve made in this country, and all the changes yet to happen. I thank everyone at Google and 72andSunny for making this project a reality, and really hope it’s impact is as potent for others as it was for me. The trip was a rigorous one; all in all we shot in 10 different cities in only 9 days, most of the time flying into one city, setting up, interviewing, then back to the airport to fly to the next. So from a production standpoint it was important to travel light, but not have us short on gear in any one location. One thing we had to take into consideration was that each location was going to be wildly different. We would be in people’s homes one day, then an office another, then a hotel conference room the next. Since we couldn’t rely on any two sets having the same lighting/power conditions, we needed to be flexible and extremely efficient with our gear. So what did we take? Well, we wanted light, cool, and not breakable as we’ll be traveling a lot. 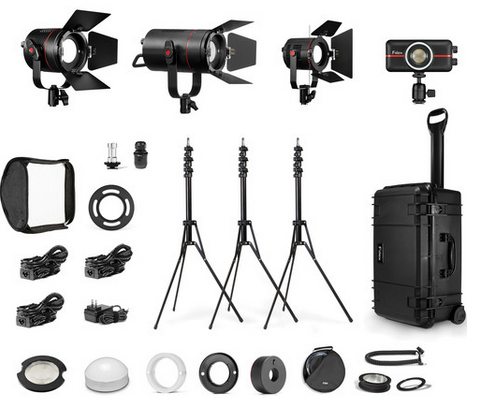 I chose the Fiilex Flexjet kit because we could have an easy three point lighting setup, with softbox, and not pop any circuits. I’m not a huge fan of LEDs, I still feel that tungsten lights give you a warmer more natural look, but I have to say these little guys really made it easy, and gave us great flexibility. 2 good ol’ 5DIII – sure I like to rock a C300 or F7, but you really can’t get over the 5D if you want something light, easy, and can take fantastic stills at the same time. I was in charge of not only interviewing, but also capturing still thats they were going to use in a live campaign, so this was a no brainer. Throw in a few Zeiss CP2s and you have a low light monster that keeps things sharp. Those that know, know that sound is the most important element to filmmaking, and certainly to good interviews. Considering that we were going to be in unsecured, highly trafficked areas I wanted to make sure we had multiple sources of sound so that any artifacts can be avoided. So, we had on camera Rode mics, Sony lavs, and a Rode boom all going into a Zoom H6n. This way we had 3 distinct separate audio tracks that can be used in post which would hopefully guarantee a clean interview. I love challenges, I really do. Coming from the digital revolution school and being used to pushing boundaries and possibilities with production is just something I crave on set. That’s why not knowing the shooting locations ahead of time is such a rush. Walking into an office, living room or conference room and having to build a set with available items is a fantastic puzzle. Trying to keep your lighting setup consistent across multiple locations is even more of a challenge. If you care to know the method, I first start with the window, if there is one (if there isn’t one I try to recreate it with a light and softbox). I let that be our pivot point, and build the lighting setup around that. Diffused sunlight is a fantastic ally on a small set, and as long as you have consistent weather conditions, you can count on it adding beautiful light. From there I like to shoot at an angle to the wall, never straight on. This gives a bit of depth and dimention. Finally… a fern. Or a tree. Or a plant. give me a bit of color, or texture and stop everything down to a f 3.5; shallow enough to get some nice cinematic DOF but still giving you a few inches of sharpness so the subjects head doesn’t go in and out of focus. Cant underestimate the fern y’all. In the end, the range of voices we covered was outstanding, from senators to athletes, from the west coast to the east. Not a day has gone by since that I haven’t looked at the world in a different way, that each step I take I am not considering the rest of the world and how they take them. As a filmmaker working in advertising there can definitely be a disconnect between reality and the machine. Sometimes we loose touch of what the conversation is and get too focused on the minutia of the moment. It’s projects like these that are the most valuable at least to me, not because of exposure or pay, but because of perspective. When you are able to meet great individuals like these and just hear them talk so passionately about life, well, there is no substitute for that sort of inspiration.